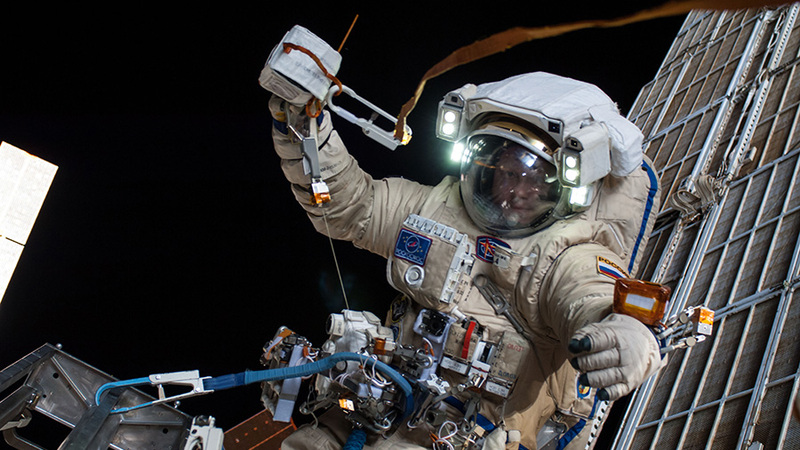 Russian cosmonaut Oleg Artemyev works outside the International Space Station during a 5-hour, 11-minute spacewalk that took place Aug. 18, 2014, when he was an Expedition 40 Flight Engineer. Expedition 56 Flight Engineers Oleg Artemyev and Sergey Prokopyev of the Russian space agency Roscosmos are preparing for their exit from the station’s Pirs docking compartment airlock at approximately 11:58 a.m. EDT. The spacewalk is planned to last about six hours outside of the International Space Station‘s Russian segment. The primary objectives during the spacewalk will be to manually launch four small technology satellites, retrieve material science samples from the hull of the Zvezda service module, and install an experiment called Icarus onto the Russian segment of the space station. Icarus is a collaborative environmental experiment between the German Aerospace Center (DLR) and Roscosmos to study the migratory patterns of small animals on Earth. It consists of an antenna and GPS hardware to track the movements of animals that have been tagged with small GPS receivers. The experiment may provide data about how animals move from one location to another, how animal population density shifts over time, and how diseases spread.